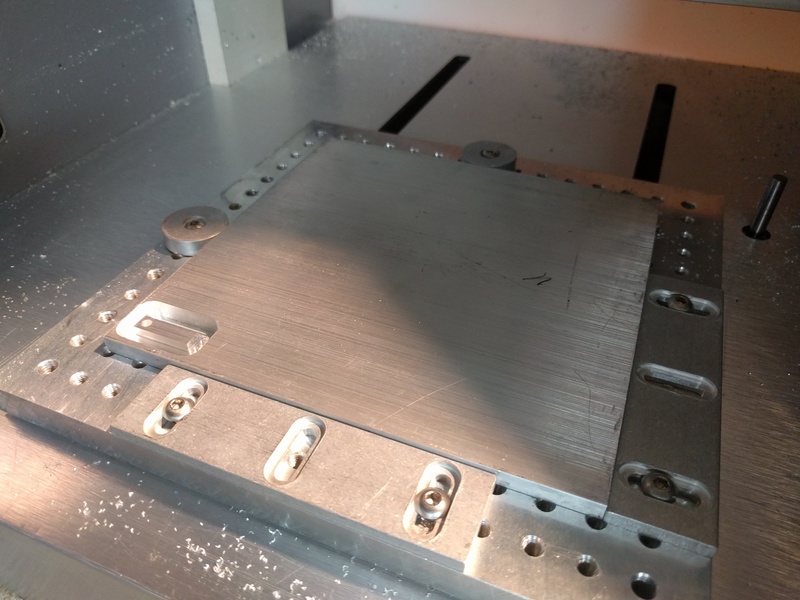 I’m fairly new to CNC-ing, been having good luck with Nomad Pro + vice machining parts in Delrin & aluminum. 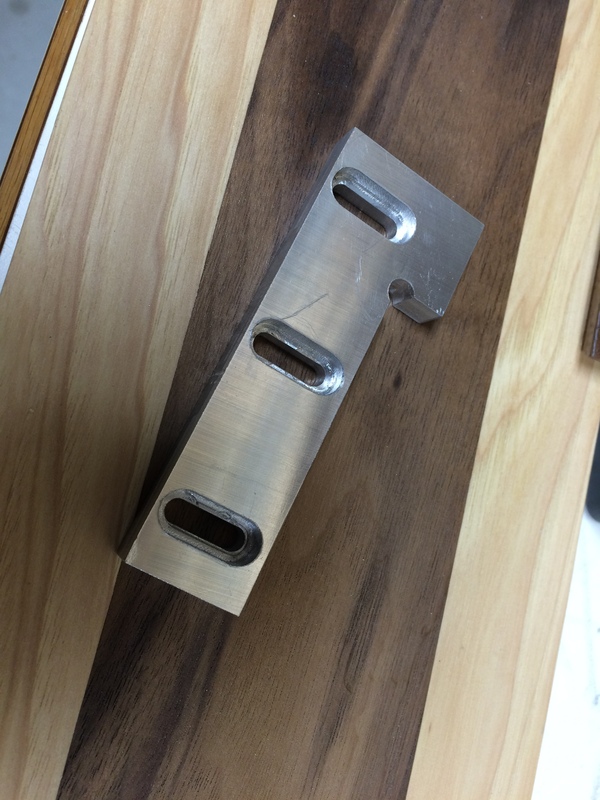 I made the jump to High Tech Systems’ sea-of-holes plate to give myself a little more flexibility in clamping. While I ordered, I figured I’d try out his cam clamps. I have yet to actually machine a part using them, as I can’t tell if the stock is fully secured. Anyone have some tips or tricks to ensure proper holding with the cams? I’m not sure you can tell if stock is fully secured with any holder. I had some cams that I made out of wood. They work ok, but I realized I wanted more surface friction later. Now I use a board across the bottom and top that has some rubber on the inner lips allowing friction across the entire part on both sides. 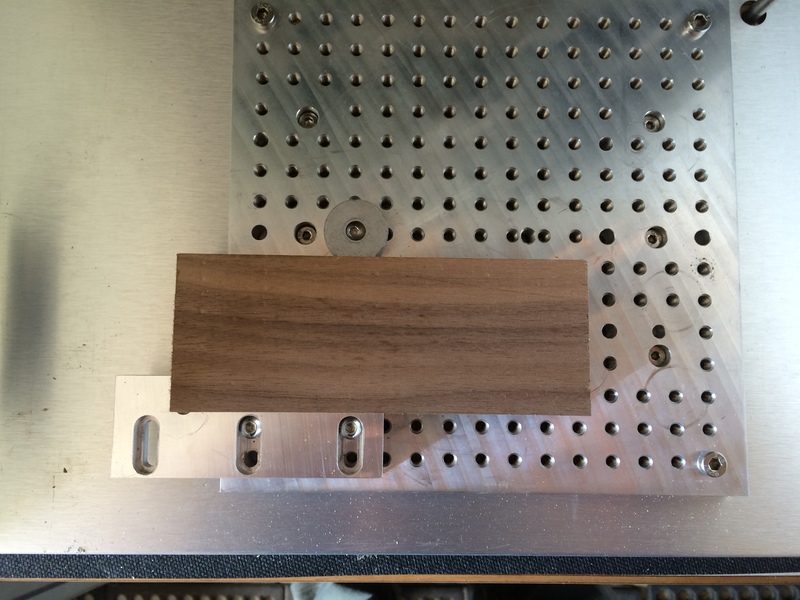 For all aluminum (I only machine thick plates) I use a down force clamp screwed into my t-tracks. You could do the same with your bed of holes. If you can get one full corner L shaped on your bed then cam the outer 2 edges against it, it should work well. If you angle the L shaped corner so as to allow the material so squeeze top surface down toward the bed, it will be even better. That is what I use when I use cams. Thanks Robert - I really like the L with angled edges. I’ll work on milling one out to use. I had success yesterday with a 6x6x0.25" piece of 6061 stock using the cams. I used the straight pieces on two edges, then cammed in the two opposing edges. I just hand-tightened them in place, and I couldn’t see the stock move at all during machining. I think the trick was pushing the cam clamps into the stock, then watching how the eccentric screw was engaging to ensure that it was turning toward the stock and not away from it. I made this clamp and use it a lot in place of the straight ones that came with the table. They’re tall enough I can stick a piece of 1/8" mdf under what I’m working on and avoid the risk of cutting into the table…and still cut all the way through material. It’s 3/8" thick. Hi Mike. I’m interested in your clamp. I have your same setup with the sea of holes bed and clamps. Did you mill it with the Nomad?. I have never milled aluminum and are interested in your clamp as my first aluminum project. Would you share your design and your mill settings?. I use Fusion 360 for design and CAM if you are willing and it’s easier for you. This thread: Depth per pass calculation has a picture of the clearing setup I’m using with compressed air, works pretty well for me. The exact alloy you’re trying to cut makes a difference. I’ve had a lot of challenges myself getting a good finish, but it’s been fun getting things worked out. The first couple clamps I made ended up with a lot of chatter, but it didn’t make a huge difference for the purposes of a clamp. You’re going to break some tools getting things dialed in. Get a handful of cheap ones off ebay or amazon until you’re comfortable - I use these as my “throwaways” https://www.amazon.com/HQMaster-Carbide-Router-Acrylic-Hardwood/dp/B010NI39WO/ref=sr_1_1?ie=UTF8&qid=1473549793&sr=8-1&keywords=1%2F8+end+mill - they’re cheap so I don’t get too upset when they snapped off. They not coated but work well enough for roughing. You think I have to get a two flute one or this would be fine for starters?. You can give it a shot. The single and two flute mills have more room for the chips. You’ll need to be all over chip control for sure. The issue with chip-recut with metals is that they almost universally work harden and heat on every cut, so if they aren’t getting cleared they’ll erode the tool. The feeds/speeds on the nomad chart are for 2 flute, you’ll have to feed faster, but it might take some experimentation to figure out exactly how fast. GWizard says: “Use fewer than 4 flutes with aluminum”, calls out 10ipm feed, 2.6 plunge with 4 flutes. I don’t have any 4 flute mills, so can’t tell you what’s really going to happen from my own experience. Someone else might have something to add though. Thank you so much for your help. Will get a two flute mill to start. Much appreciated. @mikep Thanks again for your help. While I wait for Aluminum stock and my new 2 flute end mill to arrive I went ahead and experimented a little. I had some 20mm teak around and decided to go though the process. Figuring out paths, clamping strategies and registration methods are fun to me. I enjoy this part of the process. Here is the finished piece. What I have come to realize is that while I’m getting very comfortable with milling in general in regards to feeds and speeds and tool paths and such, holding the material down requires thinking on every job. I have a sea of holes bed and a predictable center. I am trying to drill holes to hold the stock piece that obviously correspond to the bed and then plan to position the piece I’m milling also aligned so that if I’m milling channels or holes I can use these in the middle of the milling process to add screws to hold the piece prior to milling the final pass so it separates from the stock. The problem I’m having is with tolerances. This piece, being of a very hard wood, when I drilled four holes to hold the piece down, the tolerance of the holes was such that the screws would bind and I couldn’t get them to align properly. The holes were 0.002 bigger that the screw diameter. I had to get a thicker drill bit and make the holes slightly bigger. My idea is that if I can get this strategy to work properly, I can do two sided milling very easily after drilling holes for holding that could also work as registration holes. Am I battling a useless battle?. Tolerance issues on holes are usually caused by too high plunge rate and insufficient chip clearing. Also mills, while 4x better at cutting side-to-side than drill bits are 1/4th as effective at drilling. For better tolerances, use a smaller bit and cut it as a pocket. Looks good. When I cut these I use tabs (inserted with meshcam) to retain the cut part in the material, then the cams around the outside against a fixed edge. They’re easy enough to trim out afterwards (bandsaw) and a little sanding (paper on a granite tile) and you can’t tell they were there. Screw diameters vary. Thread diameter can vary quite a bit, head diameter varies from manufacturer to manufacturer too. I don’t think I left enough head clearance in the clamp - I’ve had some screws not fit in the head recess. @WillAdams I’m using TiN coated short drill bits for holes using pecking and with short slow pecks. I don’t think should be the drilling with the CNC, no?. I think the holes are too precise a diameter with a very small tolerance for position coupled with a very hard wood that is making the screws bind. @WillAdams I bought them at McMaster Carr and they have no info on the spindle speed. Will call today to see if I can get any info. Thanks. The holes seem fine and I was pecking slowly so my hunch is that the problem is the tolerance as far as positioning and diameter. The screws go in fine one by one but when I try to align them and tighten them one side is good but the other one doesn’t go in. I almost damaged my bed trying to get one screw in. The wood is very hard and once in, there is almost no wiggle room. I think I will combine two registration holes of this diameter down the center line and four, slightly wider, in the corners of the stock for holding. @mikep I also use tabs most of the time but wanted to experiment without them just for practice and experience. Since this block I will be making will be of aluminum and since two edges need to be as flat as possible, I though that avoiding them would be a good idea. 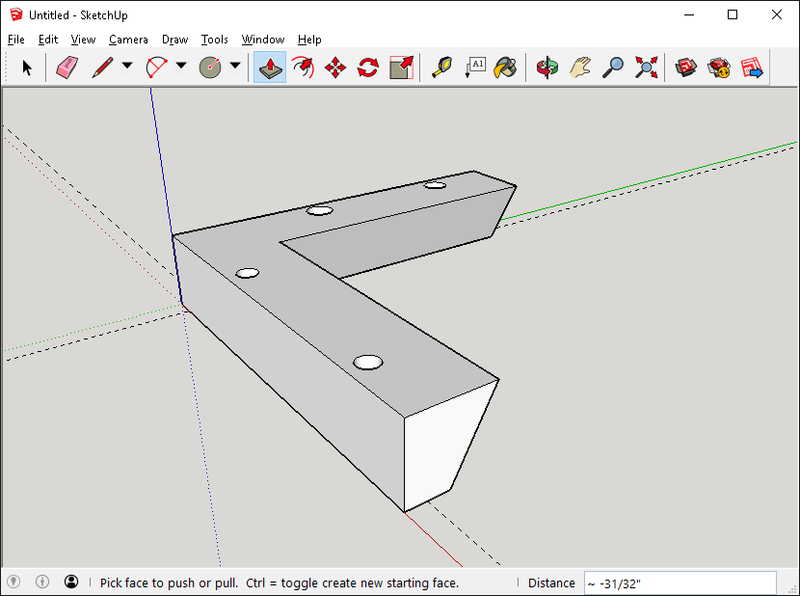 I use Fusion 360 to design and CAM and it places tabs an specified distance intervals. I don’t think I can place them where ever I want like in Mesh am, right?. Just realized that I can place tabs on specific points in Fusion 360!. Doh!.